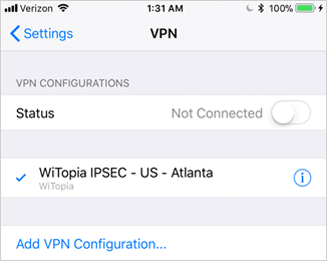 For best security and performance, we use iOS’s native VPN client. No app download required. This setup is faster, more lightweight, and closer to the wire. A straight shot to the network, with no middleman software in between also means it’s more secure with less room for exposure to exploits or vulnerabilities en route. Less parts – less problems. And, it won’t break every time there’s an iOS update ;). Choose IPSec at top of screen. You MUST use a Capital W with a backslash "\" if your vpn username is an email. All set and ready to connect! Toggle the status slider on. 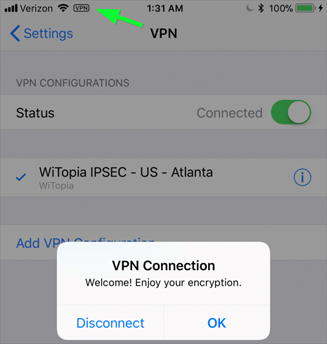 Once you’re connected you will get the message above, and you will get a [vpn] indicator icon at the top of your screen.